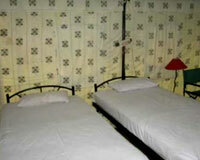 Planter's Camp is located in the suburb of Madikeri. 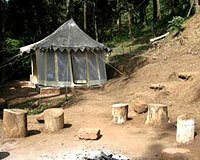 Planter's Camp is nestled amidst a forestland in the serene suburban area of Coorg. The Planter's Camp is a perfect hideaway in the peaceful backdrop of natural tranquility far from the busy schedules and hustle bustle of the city. The ambience at the Camp is filled with gentle fragrance of coffee and cardamom plantations. 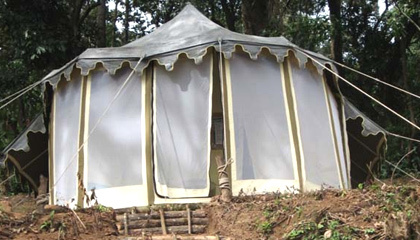 The Planter's Camp is not a conventional resort but especially designed for Eco Adventure complete with amenities and services for a memorable date with nature in Coorg. The Planter's Camp is the perfect retreat for nature lovers longing to see vibrant birds, breathe fresh air, follow the shimmering brooks, or bathe at the waterfalls. 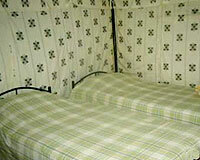 Planter's Camp offers 10 Swiss Tents with attached bathrooms and other services. Planter's Camp offers traditional Coorg Cuisine - both vegetarian and non-vegetarian like Pandhi Curry, Kadambuttu, Bamboo Shoot Curry, Bamboo Shoot Tips Fry, Rice Rotis, Chicken Curry, Paputtu, Naputtu, Mutton Pepper Fry, Coorg Mango Curry and Kuleputtu Albai.